Our bodies change as we get older. That causes our nutritional needs to change, as well. Nutrition comes from food and water. Our nutritional needs may change based on whether you are a man or woman, certain medical conditions, activity level, and age. Food provides us with the energy and nutrients we need to stay healthy. 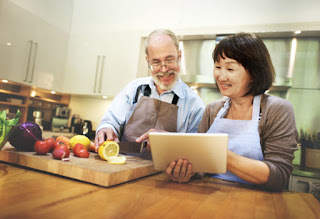 Men and women need protein (meat, fish, dairy, beans, and nuts), carbohydrates (whole grains), fats (healthy oils), vitamins, minerals, and water. These things may actually help prevent some diseases, including osteoporosis, high blood pressure, heart disease, diabetes, and certain cancers. Choose a variety of healthy foods at each meal. This includes servings of fruit, vegetables, protein, and whole grains. Avoid unhealthy calories, such as cakes, cookies, chips, soda, and alcohol. Choose foods that are low in fat and cholesterol. Avoid saturated and trans fats. Saturated fats are animal-based (red meat, dairy). Trans fats are found in processed foods. These are foods such as packaged baked goods. Watch portion sizes. Keep in mind that a 3-ounce serving of meat is about the size of a deck of cards. It’s okay to treat yourself to chips once in awhile. Just don’t mindlessly eat from a bag. Measure out an appropriate amount and then put the bag away. Buy pre-cut fruit and vegetables if it’s difficult for you to cut them yourself. Add healthy spices to your food if your tastes have changed. Do not add salt. Learn to read labels. Packaged items contain nutrition labels. These labels tell you what a serving size is, as well as the number of calories, total fat, cholesterol, sodium, carbohydrates, and protein per serving. Follow your doctor’s advice for nutrition. Not everyone has the same nutritional needs after the age of 50. A person who has diabetes may have to monitor carbohydrates first and calories second. A person with high blood pressure may need to watch his or her sodium levels more than other nutrients. Also, not all nutrients are the same. For example, the calories in fruit are healthier than the calories in cake. The carbohydrates in whole grains are healthier than those in candy. Women who are physically inactive should have 1,600 daily calories. Women who are moderately active should have 1,800 daily calories. Women who are very active should have between 2,000 and 2,200 daily calories. Men who are physically inactive should have 2,000 daily calories. Men who are moderately active should have between 2,200 and 2,400 daily calories. Men who are very active should have between 2,400 and 2,800 daily calories. As we age, sodium is a concern for men and women. After age 50, people should consume no more than 1,500 milligrams per day of salt. That’s about two-thirds of a teaspoon. Do not add table salt to your food. Read nutrition labels and watch the amounts of salt in packaged and processed foods. Canned foods and processed meats (bologna, bacon, hot dogs) contain high amounts of salt. Some sodium is good for your nerves. But too much can increase your risks of certain medical conditions. For example, too much sodium causes your body to retain fluid. This can lead to high blood pressure, heart disease, and stroke. For women older than 50 and post-menopausal, too much sodium causes your bones to lose calcium. This leads to the bone loss condition known as osteoporosis.